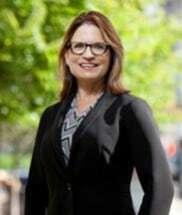 Ann T. Davies is a Partner in the firm, and leads the firm’s Family Law Practice Group. With a legal career committed exclusively to family law, Ann brings extensive, comprehensive experience to her clients in these challenging, complex and highly personal legal matters. Ann is rated "AV Preeminent®" by Martindale-Hubbell. She has taught Divorce Proceedings in the Lawyering Skills Program at the University of Wisconsin Law School, and has presented at various continuing legal education seminars on family law topics. Ann is pleased to have also served on the Executive Committee, and as Chair, of the State Bar of Wisconsin Family Law Section Board of Directors.